In a study of CKD patients undergoing renal artery stent placement, the risk of acute kidney injury following use of gadolinium-based contrast increased with decreasing renal function. 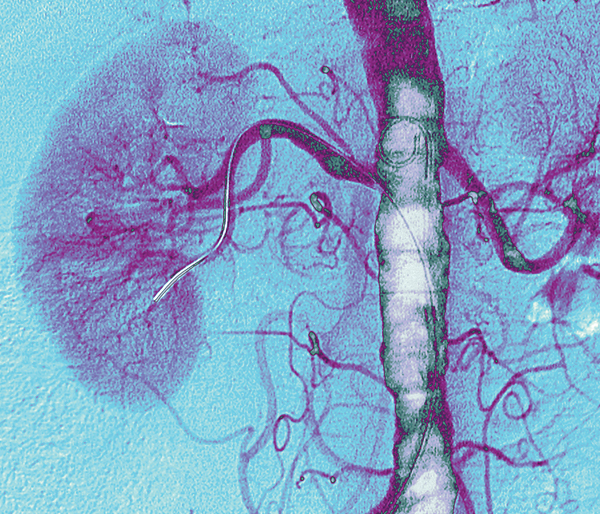 Use of gadolinium-based contrast agents during endovascular intervention in patients with chronic kidney disease (CKD) may increase the risk of post-contrast acute kidney injury (PC-AKI), according to a new study. A retrospective analysis of data from 68 CKD patients who underwent renal artery stent placement exclusively with gadolinium-based contrast agents found a PC-AKI incidence rate of 14.7%, Edwin A. Takahashi, MD, and colleagues at Mayo Clinic in Rochester, Minnesota, reported in Diagnostic and Interventional Radiology. Each 1-unit increase in estimated glomerular filtration rate (as determined using the Modification of Diet in Renal Disease study equation) was associated with a 9% decreased risk of AKI. The investigators defined AKI as an absolute serum creatinine increase of 0.3 mg/dL or greater or a relative increase in serum creatinine of 50% or greater within 48 hours of intervention based on Acute Kidney Injury Network criteria. Prehydration was associated with significant 83% decreased odds of post PC-AKI. In addition, development of PC-AKI was associated with a significant 4.5-fold increased risk of requiring dialysis and significant 2.5-fold increased risk of death. The mean eGFR was 18.2 in mL/min/1.73 m2among the 10 patients in the PC-AKI group and compared with 25 mL/min/1.73 m2 among the 58 patients in the no PC-AKI group. Takahashi EA, Kallmes DF, Mara KC et al. Nephrotoxicity of gadolinium-based contrast in the setting of renal artery intervention: retrospective analysis with 10-year follow-up. Diag Interv Radiol. 2018;24:378-384.